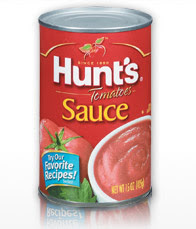 Great coupon out for $1 off any two Hunt’s Tomato Products. Use it on Tomato sauce which is typically around 50 cents a can and you have either free or more than free sauce! Go here to print it. Each computer is allowed to print the coupon twice, so that is an even better deal! Thanks to moneysavingmom for this lead! I gotta get a printer!! !